Pentecost AD 2007 - Where are the signs and wonders? "Where Have the Signs and Wonders Gone?" 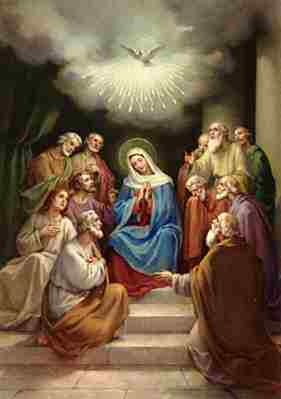 The Jewish “Pentecost” was so named in Greek because it was observed fifty days after the Passover. At the Passover, the first fruits of the harvest had been offered to God in sacrifice at the Temple; the first sheaves of wheat and the firstling lambs. At Pentecost, the barley crop had just been harvested—but since only pure wheat could be offered in sacrifice, the barley sheaves were merely waved before the divine Presence in the Holy of Holies. I mentioned to you a few months ago that it was customary for the adult Jewish men to make the journey to Jerusalem three times a year —for Passover, Pentecost, and the feast of Tabernacles (Pesach, Shavouth, and Sukkoth)—the “pilgrim festivals” prescribed in the Old Testament Books of Exodus and Deuteronomy. Those who lived outside of Israel, in the Diaspora, would make the trip less often, but it was very common to have a goodly number of foreign born Jews in Jerusalem for each of these feasts. By the time of Christ, Jewish people had been living outside of Israel for centuries, so we have the situation mentioned in today’s reading of a large gathering with people speaking many different languages. The events of this first Christian Pentecost seem spectacular, indeed. There is the sound of “violent wind,” and the sight of “tongues of fire,” and then this gift of speaking in such a way that everyone could understand, no matter what his native language. And it was no small matter that the Apostles, heretofore hiding from the Jews in the Upper Room, went out into the streets, preaching to one and all. Saint Luke records that about three-thousand received the Sacrament of Baptism on that day alone. When the Apostles Peter and John came to Samaria to Confirm the converts baptized by the Deacon Philip, they were observed by one Simon Magus—“Simon the Magician,” who tried to bribe the Apostles so that he too might have this power of conferring the Holy Ghost. Apparently, he thought that the visible manifestations of the Sacrament would be a good addition to his magic tricks! The Apostles refused, of course, and from the name of “Simon” we have the word “simony,” which means the offering of a bribe in exchange for something sacred. Later on, in Saint Paul’s letter to the Corinthians, we see that there were a number of external gifts of the Holy Ghost exercised by confirmed Christians: the uttering of wisdom and knowledge and faith; speaking in unknown tongues and interpreting them; the working of miracles, and healing, and distinguishing spirits and prophesying. From the epistle we can deduce that the Corinthians were a somewhat disorderly people—perhaps showing off to one another—and that Saint Paul was actually commanding them to make no use of these gifts unless they served the useful purpose of bringing people to the Faith or to deepen the faith of those who already possessed It. Occasionally someone will ask: “Why don’t we see such miraculous things in Church? Why don’t we see any visible evidence when someone receives the Holy Ghost in the Sacrament of Confirmation?” On Ascension Thursday and for most of the following week we read in the Gospel that those who believed and were baptized would heal the sick, and speak in new tongues, and be able to handle snakes and drink poison without effect. Signs like this indeed confirmed the preaching of the Apostles and won them many new converts. So why don’t we see them today? I may have just answered that question: The visible signs accompanying the Sacraments were necessary to convince people that the Apostles were correct in what they preached, and, so to speak, “jump start” the membership numbers of the infant Church. From what we observe around us, God designed a very orderly universe, and only rarely does He suspend His own laws to allow the working of a miracle. Historically speaking, we are not sure exactly when the visible miraculous signs ceased to accompany the administration of the Sacraments. In his very same letter to the Corinthians, he informed them that, eventually, “prophecies would be made void, and tongues would cease, and knowledge would be destroyed.” We don’t hear any thing more of charismatic gifts after Saint Paul's stay at Ephesus around the year 53 A.D.—not even in the writings of Saint John, who seems to be of a far more mystical bent than Paul. Some suggest that the cessation miraculous signs took place in 70 AD, with the destruction of the Temple, when the Church seemed to lose Her major competitor. We know that Pope Clement I, writing to the Corinthians around 95 AD, indicated that the signs were a thing of the past. Is it so, my brethren, that because you do not see these signs, you do not believe? On the contrary, they were necessary in the beginning of the Church, for, in order that faith might grow, it required miracles to cherish it withal; just as when we plant shrubs, we water them until we see them thrive in the ground, and as soon as they are well rooted we cease our irrigation. The signs and the wonders seem to have ceased. But the Sacraments have not. When we have Confirmation administered here, later this year, those who receive it will receive the Holy Ghost, every bit as much as the Apostles did on Pentecost. They will be strengthened in their faith, and become more able to profess it. They will be marked with the perpetual character of the Sacrament. They will be strengthened in sanctifying grace, and fortified in the gifts and the fruits of the Holy Ghost. Fear of the Lord so we may dread sin. St. John Chrysostom, beginning of Homily XXIX on First Corinthians www.ccel.org/fathers2/NPNF1-12/npnf1-12-34.htm#P1424_844732. See also Homily XXXIV www.ccel.org/fathers2/NPNF1-12/npnf1-12-39.htm#P1650_1005648 on prophecies disappearing and tongues ceasing and knowledge being destroyed. Gregory the Great, commentary on Mark.